Why Certifications in Industry Best Practices? Why the PMP®, PMI-ACP® or PMI-PBA® Certifications help your career? Why PMP(R) Certification? What's In It For You? Why PMI-PBA® Certification? What's in it for you? Why PMI-ACP® Certification? What's in it for you? 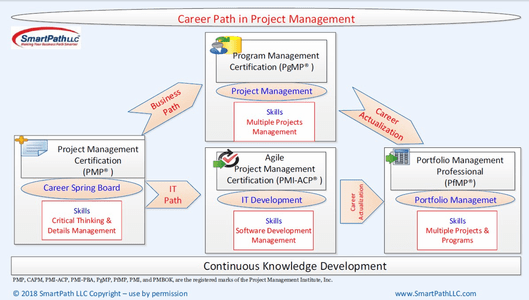 Career Paths Project Managers are often taking as Contractors / Consultants - Click on the diagram to the left to enlarge. PMI, PMI-PBA, PMP, PgMP and PMI-ACP are the registered marks of the Project Management Institute, Inc.